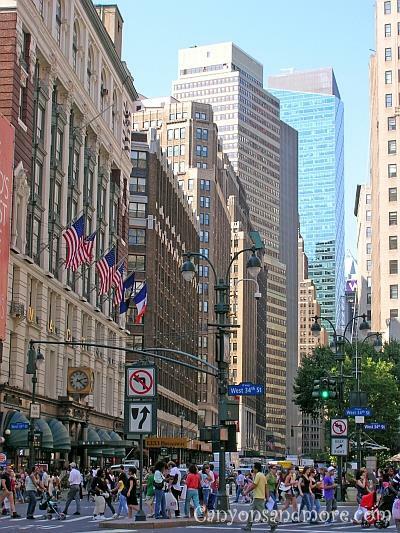 In Manhattan there is so much to see and do.... and just a few of the many possibilities are shown in the images here. These are like the attractions that most tourists want to see if visiting the city for the first time and only have limited time to see the sites. One thing is for sure, boredom does not exist in this city. It is hard to even explain where to start and what to do first. 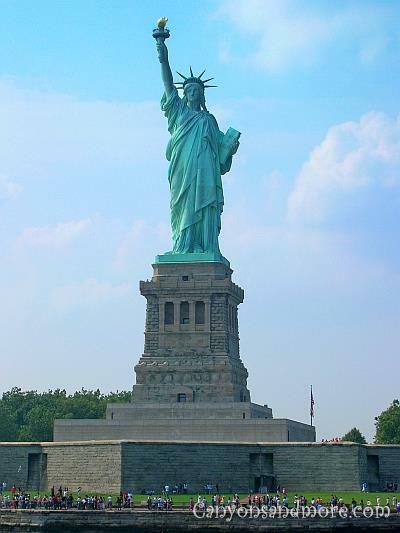 New York City has many typical tourist attractions and the other highlights can be discovered along the way. These are pictures made at various locations in the city of New York and just a few of the many highlights of the fabulous “City That Never Sleeps”. This view in the image above is from the top of the Empire State Building. From there you have a 360° view of Manhattan. What is also fascinating is the sound of the city from coming from below. The honking cabs and the police or fire department sirens really seem to echo up through the corridors between the buildings. That is the sound of New York! It is loud but just adds to the big city feeling. 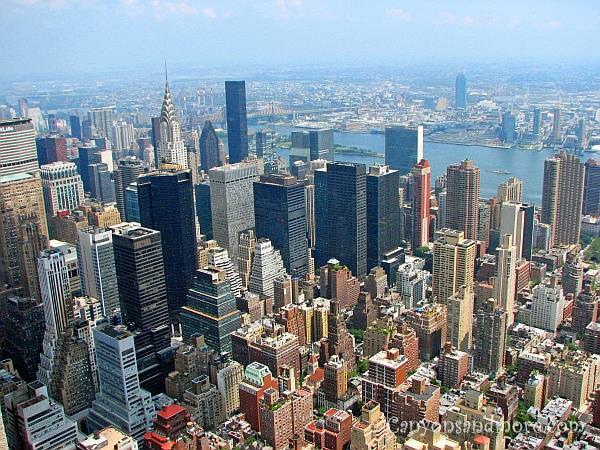 The Manhattan skyline is probably the most well known of the world. What is it like being in the middle of Manhattan for the first time? It is somehow like standing in the middle of a deep valley with mountains of buildings surrounding you. Each new corner presents you a new “landscape”. No matter how far you walk, it just does not seem to end. 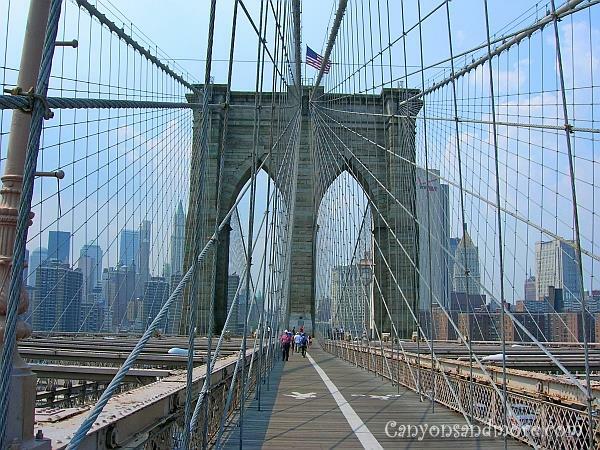 The Brooklyn Bridge is probably the most well known and the most photographed bridge of New York City. Walking across the bridge is a must when in the city. The feeling is fascinating while standing on the Brooklyn Bridge. You have a great view of the skyline and over the East River. You can walk the entire distance across the bridge to reach Brooklyn from Manhattan. The distance across the bridge is just over 2 kilometers. On either side of the bridge, cars travel to their destinations - either Brooklyn or Manhattan and the view of Manhattan City Skyline from the bridge is worth the stroll! During the summer, there are even a couple of people selling refreshing drinks at the center of the bridge. From the piers at Battery Park tourists can take ferries to see the Statue of Liberty. There are different tours available. For those wanting to go on the island and up into the statue, the lines can be quite long and cause hours of waiting time. There are other alternatives such as tours that just go around the statue (to take pictures) and also under the Brooklyn and Manhattan Bridges. The skyline looks incredible from the water. 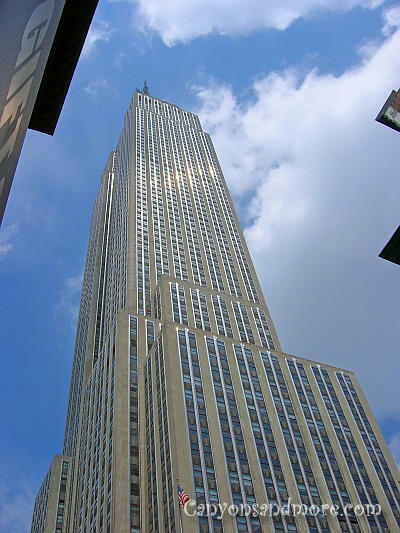 The boasting skyline of New York City and Manhattan can be well experienced from the observation point of the Empire State Building. For the best view, it is recommended to choose a day that is not so hazy if you have a choice. The cost for adults as of July 2007 was $18.00 but the view is really worth the price. After paying a fee and waiting for hours in line for the elevator, you are then taken to the top. The 86th floor is is pretty much the highest you can get. From that point it is still quite a distance to the top peak. From the Empire State Building you can get a 360° view of the city. The view from the south side is fantastic because you can see not only uptown and downtown Manhattan, but also the Statue of Liberty and Brooklyn and Manhattan bridges, as well. 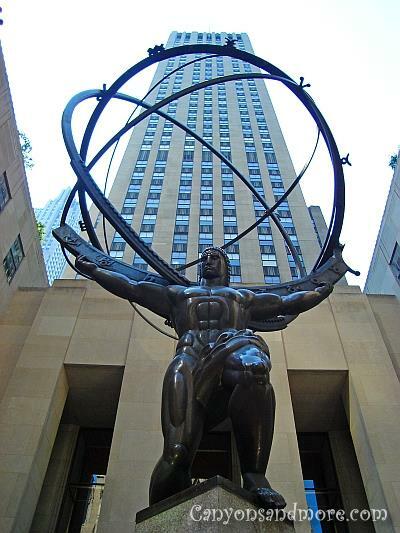 The Rockefeller Center is a huge complex of stores and offices and this Atlas Statue makes an impressive entrance for this building. Just across the Atlas is the St. Patrick’s Cathedral. Its high peaks can really conquor with other dominant structures of the city. This image features the middle of New York City at an intersection at 34th Street. At any time day or night, there is so much activity going on. Residents are heading off to work and tourists are all anxious to see all the sights of the city. Times Square is a must to see to get a feeling of the city. So many flashing and blinking lights and billboards, honking taxis, unendless traffic jams, and thousands of people to be seen. It seemed almost crazy but was fun just to stand there and watch. 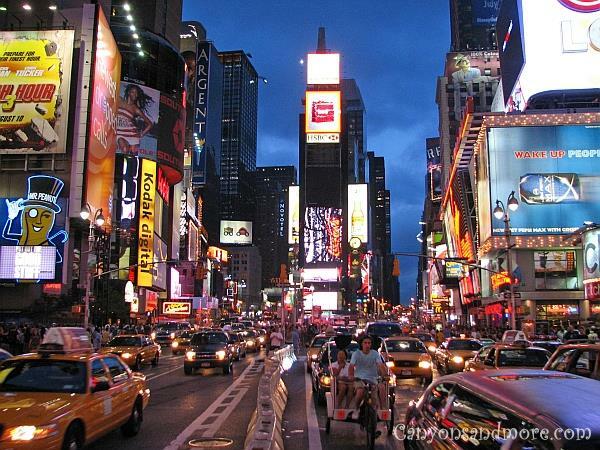 The atmosphere of Times Square in the evening is especially exciting and proof that this city never sleeps. 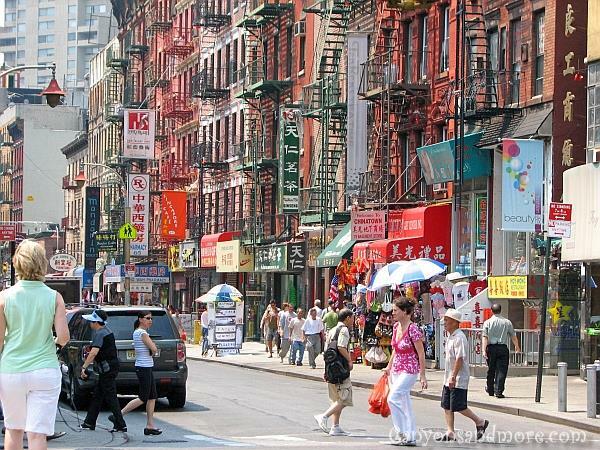 China Town is also an interesting area of the city to visit. The shop windows are an attraction for themselves. During the day, the park seems safe enough to walk through. Tourists are all over to be found. But be warned to avoid the park in the night hours. Dominantly tall structrures encircle the park. Even though you are in the middle of the city, once deeper within the park, it seems so serene and quiet. Other areas offered recreation, sports and fun for kids and adults alike. Families can spend quality outdoor time with their kids by row boating. 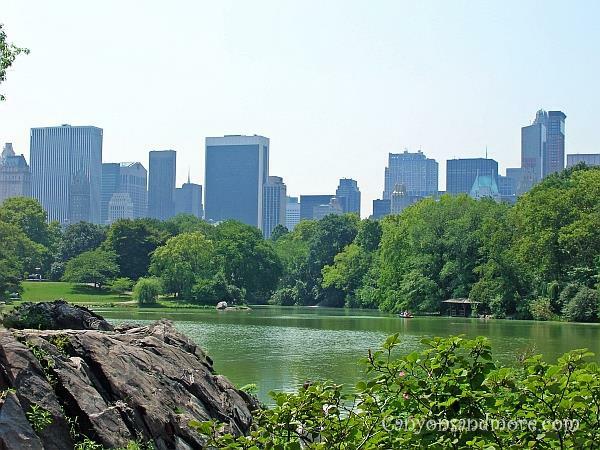 The residents of New York City can be proud of this piece of nature. Probably the cutest residents of the city are the squirrels found scampering all over the park. 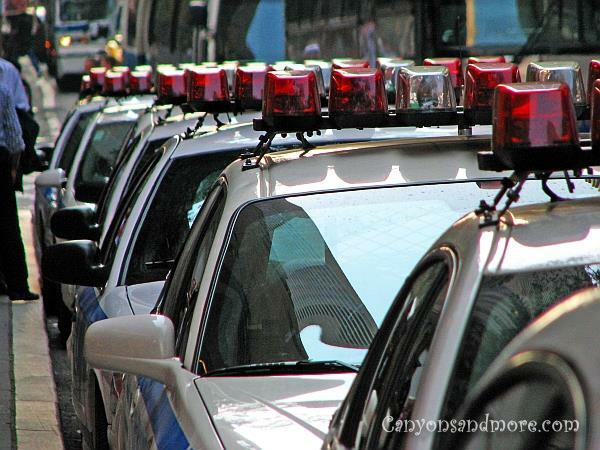 While walking down the road by Radio City Music Hall, a whole line of New York City Police Department cars were parked alongside the street. The police presence was seen all over the city.